Give a touch of jazz to your car with these fun Zebra accessories. 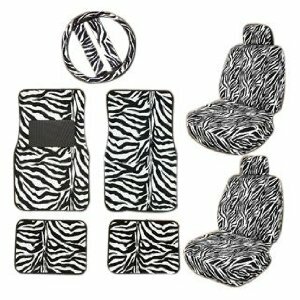 Total 11 pieces of car accessories set includes 2 pieces of seat covers with 2 separate head rest cover. Made with high grade heavy weight acrylic fabric with velvet and fury feel. These Low Back seat covers will fit any car SUV, truck or van with regular bucket seats. It will also fit seats with arm rest (zipper on the side). 2 front and 2 back pieces carpet Zebra print mat with nibbed tip backing. The front piece size is 27″ X 17.25″, rear size: 17.5″ X 13.25″ and Steering wheel cover (fits steering wheels with 14.5″ ~16″ diameter, and 2 seat belt covers.